While technically this book has words and does not necessarily fit into our Wordless Picture Book bimonthly theme last March/April, I just could not resist including this book which called out to me from the library shelves. I decided to include this in our Whodunit Database instead because it has multiple deaths, shrouds of secrecy, and yes the classic “who is good/who is evil” conundrum among the characters. And so began The Book Without Words. This description alone is sufficient to establish the setting and the general whodunit feel of the book. I have googled some of the places as indicated by Avi in his introduction but I was only able to find a picture of Saint Osyth’s Cathedral. St. Osyth’s Cathedral. Click on the image to be taken to the websource. The website indicated that the Church has stood on the site for at least 900 years. It was said to have been built in 1118 by Bishop Belmeis – not 1046 as depicted by Avi in the book. Of course Avi may have used creative license in his writing or may have envisioned a totally different church as compared to this one which is still presently standing somewhere in the UK. Wordless Magic Book, Stones of Life, and a Green Eyed Boy Burning with Earthly Desire. This lovely book has all the ingredients (perfect alchemical mixture) to a fast-paced YA read with a handful of aphorisms and ponderables to consider in a quiet evening, alone. Issues concerning life and death, immortality, reality of magic, truths concealed in fables would most likely arise. Imagine an ancient book filled with blank parchment which contains elusive truths that are revealed only to a green-eyed being who is desperate enough to read the shimmering secrets found in the fragile, near-crumbling pages. Add to that the stones of life (the infamous philosopher’s stone which has been the subject of so many bestselling books, Harry Potter being one of them), a talking raven, a simple-minded thirteen year old servant, a mad alchemist, a troubled monk, a power hungry Reeve, a greedy apothecary, and a young boy in need of love – and you have a timeless classic in your hands. St. Osyth Priory – the Gatehouse. Click on the image to be taken to the websource. Northumbria trails – click on the image to be taken to the websource. The science and art of alchemy and wizardry. In this book, Avi speaks of four stones which need to be consumed in a specific order: (1) Life, (2) Thoughts, (3) Magic and (4) Time. From that alone, one can make inferences and educated guesses as to why it should be taken in this order. And as the narrative unfolds, the reader is able to sift out the meaning and its seemingly irreversible nature. “With his left hand, he reached into a round box and removed a perfect cube of white clay. With his right hand, he kneaded the clay until it became as soft as the nape of a newborn’s neck. With his left hand, he placed the clay at the bottom of the pot – in its exact center. Weak heart fluttering with excitement, Thorston used his right hand to pour a flagon of water over the clay. The water was holy water siphoned secretly from the cathedral’s baptismal font, then tinted pink with a drop of his own blood. I just had to include that – my goodness, where does he find all these in his consciousness? Or maybe it is an altered state of consciousness/parallel planes of awareness that bring about this array of images in his head, I really don’t know. But it’s awe-inspiring. This downloadable pdf link created by Ellen Everett Myrick from btsb.com/libcorner is also an amazing resource that details possible discussion questions, various activities involving proverbs and fables, a glossary of terms, and a detailed interview with the author himself! “To what purpose, Master?” said Odo. About Avi. Iphigene (or Mary as she was named here previously – we changed it so that there’d be no confusion about our names which are anagrams) has done a review of Avi’s Strange Happenings here. And she has also given a detailed description of the author Avi in her post. If you wish to know more about the author, click here to be taken to his official website. 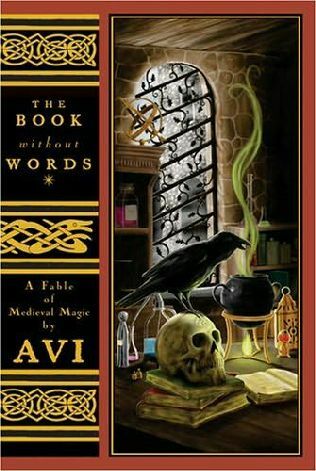 The Book without Words: A Fable of Medieval Magic by Avi. Hyperion Publishing, 2005. Book borrowed from the community library. WOW! Lovely, I enjoyed your review, my interest is certainly peaked. Hi Sammy, thanks for visiting. I’m glad you liked it. This sounds eerily evocative and wonderfully Medieval. From some of your quotes there seem to be some real profound nuggets of truth woven into the story also. What an awesome hook that first sentence is! Avi has me entwined already there. I know I would love this, Myra. Thank you.